In a medium bowl add graham cracker crumbs, flour, muscovado sugar and butter. Use a fork to mix everything together and then pour the mixture into the baking pan. Press the mixture into the bottom of the prepared pan and bake for 10 minutes or until set. Remove from the oven to a cooling rack and let it cool slightly. Do not turn off the oven. Meanwhile, using a stand or electric mixer, beat cream cheese and sugar until smooth. Then add in eggs and vanilla extract. Continue to beat until combined. Pour filling over the crust and spread evenly with a spatula. 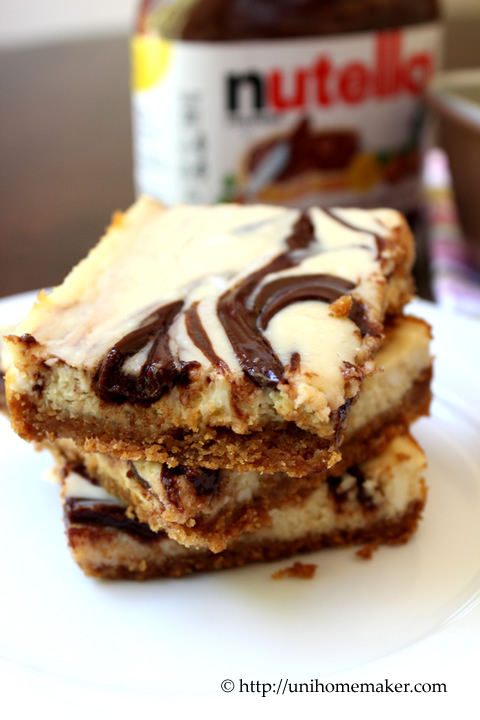 Drop individual tablespoons of Nutella over the filling. Using the tip of a knife or chopstick, carefully swirl Nutella into the filling. Do not disturb the crust. Return pan to the oven; bake for 20-22 minutes or until filling is set. Cool for an hour then refrigerate until completely chilled and firm before cutting into the cheesecake. oooh, this looks so good. 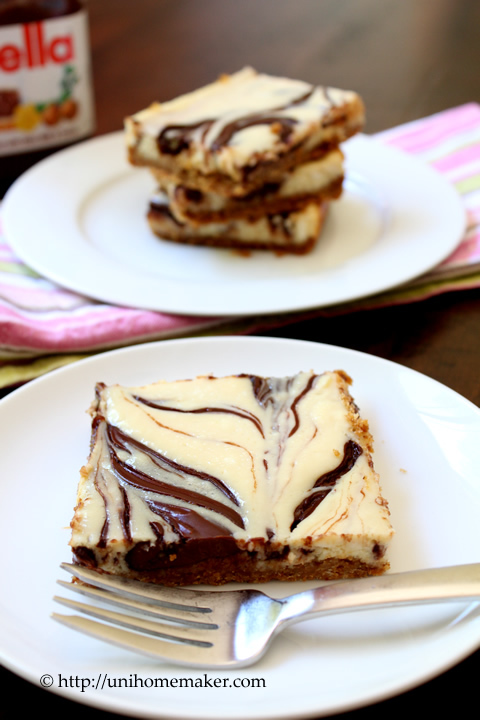 they almost look like brownie bars… so easy to make. thanks for sharing. this would make me happy any day! You had me at Nutella. 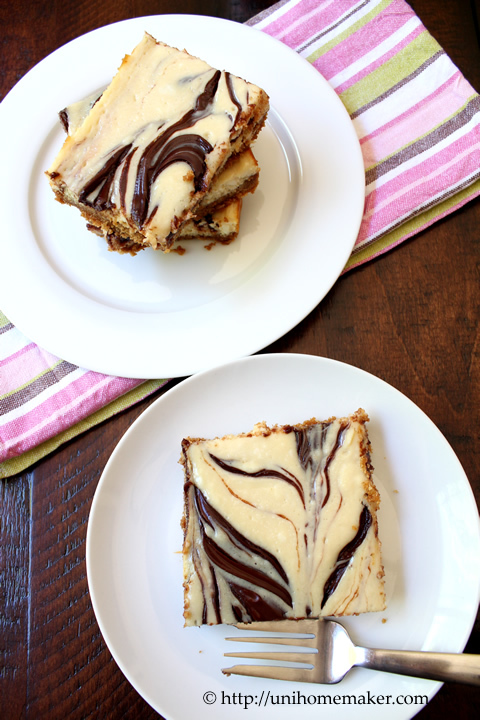 These cheesecake swirl bars are calling my name! You couldn’t of made a better choice for your first cheesecake! Love the combo with nutella! Completely irresistible. Have a good week Anne! Getting hungry just looking at those! They look really good! 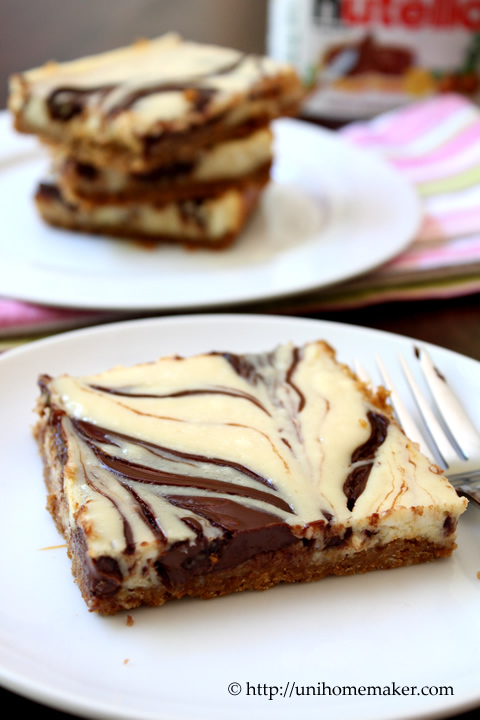 Mmmmmmm …these cheesecake Nutella swirled cheesecake bars look irresistable & very appetizing too! Yummmm! Looks delicious! What is muscovsdo sugar and what can I use as a substitute? Thanks! Hi Angela: I would say about 20-22 bars. Enjoy! Can U use this in a ready made graham cracker pie crust? Hi Sheila: I have never tried it using a ready made graham cracker pie crust. You can try it but you might have some leftover batter with these measurements.